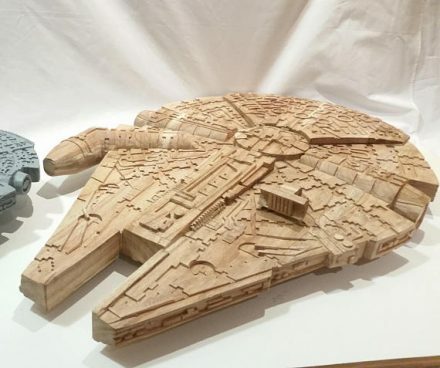 Made by Etsy store lovemycustomwood, this Millennium Falcon model comes in at 32 1/2″ x 21 1/2″, and is carved from solid white cedar. The shop also offers other Star Wars themed pieces, including a smaller Falcon at half the price, various SW helmets, and an AT-AT and TIE Fighter. This entry was posted on Monday, February 19th, 2018 at 00:27	and is filed under Toys. You can follow any responses to this entry through the RSS 2.0 feed. Both comments and pings are currently closed.